Finally deleting a record from the same database table. In order to configure Spring Framework with Hibernate to perform database operations, we will use a very important template class provided by Spring Framework which allows us to use Hibernate to perform database operations , named - HibernateTemplate. A HibernateTemplate property named hibernateTemplate used to initiate object of HibernateTemplate class, used to perform Hibernate database operations using Spring. This HibernateTemplate property will be assigned a value by the Spring Container using its setter methods, when the CustomerDAO bean is created by it using the configuration xml file(to be created in the upcoming section). Note : In the above mentioned DAO class, an important Spring Framework's annotation i.e. @Transactional is used and placed just before the methods i.e. addCustomer(Customer c) and deleteCustomer(int id) used to perform database transactions such as - insertion and deletion of records in the database. Reads XML to create the CustomerDAO bean named CustomerDAOBean and initiate its property hibernateTemplate with a value by calling its setter methods i.e. setHibernateTemplate(). Using CustomerDAOBean, the method of CustomerDAO class is called i.e. createTable(), to create a table in database. Using CustomerDAOBean the method of CustomerDAO class is called i.e. addCustomer(int id, string name, string address, int age), to add a customer to the database table. Using CustomerDAOBean the method of CustomerDAO class is called i.e. getAllCustomer(), to get a List of all the customer stored in the database table. Using CustomerDAOBean the method of CustomerDAO class is called i.e. countCustomer(), to get a total count of all the customer records stored in the database. Using CustomerDAOBean the method of CustomerDAO class is called i.e. deleteCustomer(int id), to delete a customer record by using its id value. This mapping document is essentially required by Hibernate to map the Customer class and its instance variables/properties to a database table and its columns. This mapping document ends with an extension .hbm.xml, hence, we have named it customer.hbm.xml. The table attribute within the <class> element defines the name of database table to be created for the class in the database i.e. customer. In this file, we have configured a CustomerDAO bean with a unique id and with its HibernateTemplate property named hibernateTemplate. This properties will be assigned a value by the Spring Container using their respective setter methods, when the CustomerDAO bean is created by it using the configuration xml file. The name child attribute refers to the name of a property in the CustomerDAO class i.e. hibernateTemplate. For example - ref="hibernateTemplateBean" refers to a HibernateTemplate bean with id having a similar value - hibernateTemplateBean, declared in this configuration file, to initiate the HibernateTemplate object. transaction-manager - This property is used to specify the name of transaction manager bean, which is matched with the id of another bean declared in this configuration file within another <bean> tag. datasource - This property refers to a data source implementation class declared in this configuration file. mappingResources - This property refers to a hibernate configuration file named - customer.hbm.xml, used to map the objects of Customer class to database using Hibernate with Spring. to connect to the database and perform JDBC operations using Hibernate with Spring Framework. The JARs are associated with the Spring Framework. The JARs associated with the Hibernate ORM. The JAR file associated with the JDBC to work with our Oracle database. These JARs are required in order to successfully execute this Spring project as we are working with JDBC using both Spring Framework and Hibernate ORM. All these JARs associated with the Spring Framework are included in its installation folder named libs(within our Spring installation folder). So, we need to add all the JARs in the libs folder to our build path of our Java project. Next, we are going to add some more JARs files to the build path of our Java project. These JARs make the Hibernate work with our database using a specific JDBC Driver for our particular database. 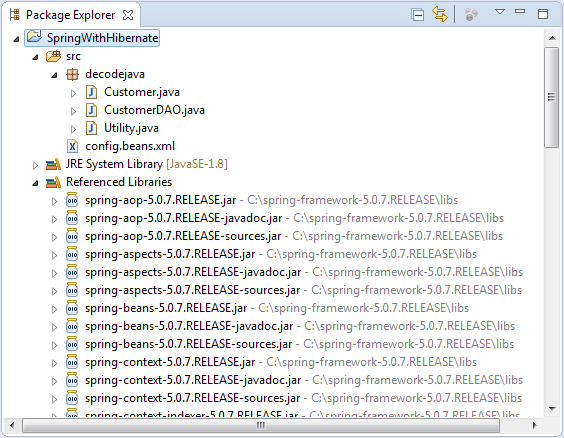 Project Folder - SpringWithHibernate is the name of our Project and it is a top-level directory. A POJO class named Customer.java. Finally, after executing Utility class, you will get the following output within the Console window. This output shown below, shows how the Utility class has used the ApplicationContext container of Spring Framework to load the configuration xml file - config.beans.xml, access the beans specified in it, instantiate the CustomerDAO class and performs JDBC operations by calling the methods of CustomerDAO class using Hibernate with Spring Framework. Hibernate: select customer0_.Id as Id1_0_0_, customer0_.Name as Name2_0_0_, customer0_.Address as Address3_0_0_, customer0_.Age as Age4_0_0_ from system.customer customer0_ where customer0_.Id=? Hibernate: delete from system.customer where Id=? And, this concludes configuring Spring Framework with Hibernate ORM.